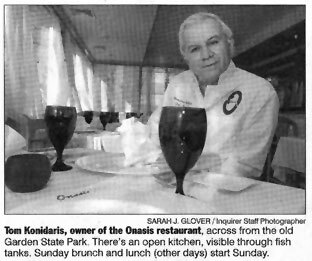 The lobster tank is gurgling and the seafood case is brimming with sea bass, langoustines and oysters at Onasis, a brand-new, polished Greek BYO across from the old Garden State Park (806 Haddonfield Rd., 856-488-5888). Chef Tom Konidaris of Zesty's in Manayunk, and Eric Papougenis, his partner in Manayunk Diner, opted to gut the old Cherry Tree Diner in favor of light wooden floors, white tablecloths, handsome tile, cobalt- blue glass, and bright Greek murals. There's an open kitchen, visible through fish tanks. Menu is mainly seafood, especially fresh fish sold by the pound. It's open for dinner now, seven nights. Entrees start at $16 for pasta and head into the mid-$20s for seafood, lamb, beef and ostrich. Sunday brunch and lunch (other days) will start Sunday.